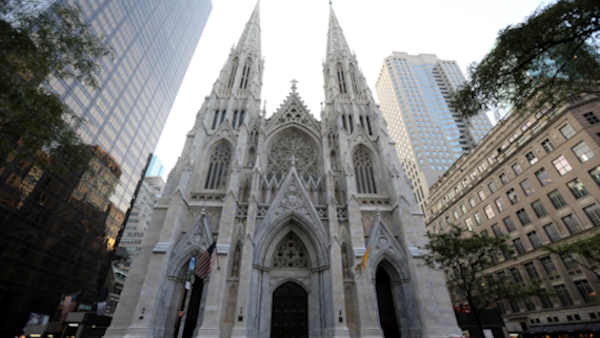 NEW YORK -- The Archdiocese of New York is seeking a $100 million short-term mortgage on property it owns near St. Patrick's Cathedral to fund a compensation program for victims of clergy sexual abuse. The Manhattan-based New York archdiocese - the nation's second biggest after Los Angeles - announced a program last fall to begin paying abuse victims. Cardinal Timothy Dolan has portrayed the process as a "tangible sign of the church's desire for healing and reconciliation." U.S. Catholic leaders have grappled with a clergy sexual abuse crisis since 2002. Nationwide, the church has paid nearly $4 billion in settlements since 1950, more than 6,500 clergy members have been accused of abuse and hundreds have been removed from church work. Joseph Zwilling, a spokesman for the New York archdiocese, said 144 people have been approved to receive compensation for abuse claims - some dating to the 1980s or earlier. Specific details on how much money the 144 people are receiving have not been disclosed. Zwilling says the current application for a $100 million mortgage will help begin paying those claims. He said plans for the short-term mortgage were announced by Dolan last fall. Church officials also are fielding new claims; so far 26 additional alleged victims have come forward, he said. They have yet to determine how many people eventually will seek compensation. Once a final number has been determined church officials will seek a longer-term loan, Zwilling said. The land being mortgaged is on the site of a luxury hotel on Madison Avenue in midtown Manhattan. The archdiocese has owned the property for many decades and leases the land to the owners of the hotel. Zwilling declined to disclose how much the archdiocese receives. It is located across the street from the rear entrance to the landmark cathedral.